Do you love skating? If so, you’re likely a regular at Firehouse Skate ‘N Play. Whether you love skating for its serious health benefits or just because it’s fun, you have likely considered buying your own pair of skates or roller blades. If you’re still on the fence about renting or buying, read on and we’ll help with your decision! One of the biggest factors to consider is obviously price. If you’re a casual skater, chances are it will be more affordable to rent your skates from us each time you visit. But if you’re more serious, buying and maintaining your own skates can actually save you money in the long run. Of course, you also need to consider the age of the skater. If you’re thinking about purchasing skates for the whole family, you’ll definitely want to consider the age of your children. If your child is still at an age where they are rapidly growing, it will probably be more economical to keep renting for your child so that they don’t keep outgrowing their skates. If you do decide to rent, then we have you covered! Our roller skates run from a toddler size 7 all the way up to an adult size 15. We also offer adjustable skates for small children. 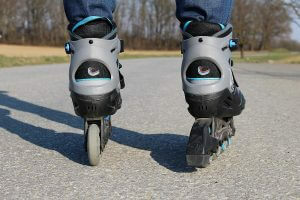 Our rollerblades start at a youth size 12 and go up to a men’s 13. Regardless of whether you own your skates or would prefer to rent from us, we hope to see you soon at Firehouse Skate N Play! Everything is better on roller skates, right? Our team at Firehouse Skate ‘N Play says “absolutely!” Roller skating is a great way to build endurance and get in shape. Check out some cool games to play next time you’re at the rink. Lace up your skates and have fun with friends with this classic game. One person is selected to be the “tagger.” This person goes around trying to tap their friends, while everyone else tries their best to stay away from the tagger because if they are tagged-they’re frozen! A classic game of limbo, on roller skates! See how low you can go on skates. Don’t touch the stick. Classic relay races are also fun on roller skates. Pick up speed and bring your team to victory! Everyone skates until the music stops then everyone has to skate to 1 of the 6 numbers of the rink. The dice is rolled. If your corner is rolled, you are eliminated. The game goes on until only 1 person is left standing. 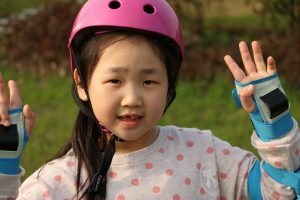 These are just some of the fun games kids can play on roller skates. It’s a fun way to get the kids moving. Join us this week for Open Skate at the rink. Visit our website for session hours and admission details. For more information about admission and party bookings at Firehouse Skate ‘N Play, visit our website or give us a call at (540) 890-2250. 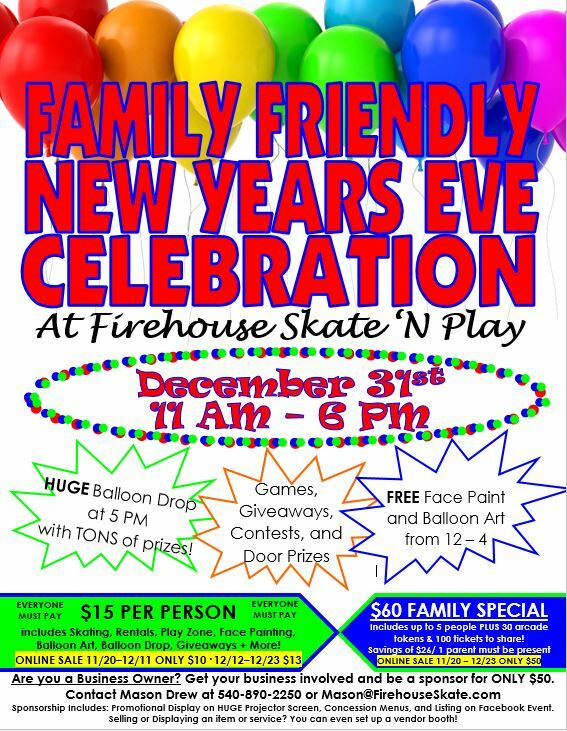 Do you enjoy bringing your family to Firehouse for some safe fun? Rate and share your experience with us in the review section of our Facebook page today. We always enjoy hearing from you! 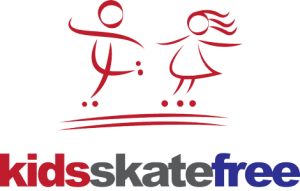 The Kids Skate Free is a national program offered by the Roller Skating Association. Kids Skate Free and Firehouse Skate N Play encourages children to stay active and fit by offering them two opportunities every week to go Roller Skating. The Kids Skate Free Program has a total of over 950,000 children registered throughout the entire United States! Parents who wish to participate may register online by clicking here. Birthdays are better at Firehouse Skate ‘N Play. When you book a roller-skating party, we do everything we can to make sure you have the time of your life. That means taking care of setup and cleanup, providing a dedicated Party Hostess to serve pizza and drinks, and keeping the good times rolling all afternoon (and beyond—we give the guests free skate passes for next time). We do a lot to make sure your child has the best birthday party ever. Here’s how you can make planning a kid’s birthday party a piece of cake! Plan early. Leaving the party planning until the last minute is a recipe for stress. Book your party early to ensure you get the time you want, give parents more time to send RSVPs, and plan those extra touches that your child will never forget. Pick your package. Firehouse Skate ‘N Play offers birthday party options for every size party (and budget). Do you want to surprise your child with glow gear, and other fun freebies? Upgrade to the GLO-CRAZY Party Package. Get a great gift. Nothing suits a skating party like new roller-skates. Limit the guests. 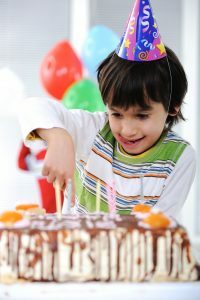 Younger kids may feel overwhelmed with a big birthday crowd, while older children probably want all their friends to attend their birthday party. A good rule of thumb is to invite the same number of guests as your child’s age. Avoid meltdowns. Nobody wants crocodile tears on the big day. Make sure the birthday kid gets plenty of rest before the party, eats a full breakfast, and comes to Firehouse ready to roll. It’s party time! Call to book your child’s birthday party in Vinton. The school year has reached its end, and summer festivities are already gearing up! The summer break is a great time to enjoy some time off from the rigors of exams and projects to relax and have fun. This time of year everyone wants to make the most of their time off, but what summer activities are the best to pursue? Thoughts of summer swing towards the pool and enjoying a little sunshine, but for us, there is no better way to spend your time off than at Firehouse Skate ‘N Play in Vinton, VA! Find out why a summer spent in the rink is a summer well spent! Great Exercise – With school related sports and activities at an end, it can be easy to fall into unhealthy habits. Roller skating is a great and fun way to stay active in the summer. Great for Everyone – Roller skating isn’t great for just one group of people, it’s great for everyone! Bring the whole family or just yourself, roller skating has something to offer all ages. Summer Hours – Our summer hours will take effect beginning June 12th. Check out our hours and plan your next visit! If you’re an avid skater, roller-skates are a great investment. You can choose your favorite skate style, customize your skates for skating sports, and save money on skate rentals. But with great skates comes great responsibility. Do you know how to maintain your roller-skates? You can extend the life of your skates with just a few simple tricks. Clean them up. Dirt can erode your boot, trucks, bearings, and wheels, wearing out your roller-skates faster. Keep the boot clean and dry, wiping away excess moisture if they get wet from sweat or spills. Let your boots dry naturally in a well ventilated area. Clean your bearings and wheels to keep things rolling smoothly. Tighten your trucks. While more advanced skaters may loosen their trucks to improve maneuverability, most skaters should make sure their trucks stay tight to the boot. Unsecured trucks can be dangerous, so ask a pro if you’re not sure what to look for. Touch your toes. Some skates have adjustable toe stops. Skaters can experiment to find the right toe stop position. For non-adjustable trucks, check them occasionally to make sure the toe stop stays tight to the boot. Spin your wheels. If they’re slow or catch mid-spin, there’s likely a dirt build up. Clean your wheels and they’ll be as good as new. If your wheels are worn or marked with divots, replace them before they cause a problem. Nobody wants a pile up on the skating floor! Looking for a new pair of wheels or a new pair of skates? Swing by Firehouse Skate ‘N Play and ask about our options! Firehouse Skate Adds Skating Lessons! The Firehouse Skate ‘N Play is pleased to announce the addition of a skating lessons program for the 2017 summer season beginning June 3, 2017. Led by instructor Susan Geary, the 5-week program will teach basic roller skating skills, including forward skating, stopping, falling down, getting up, scissors, and beginning backward skating. The fee of $65 includes the 45-minute lesson, admission to the public session immediately following, rental skates, and play zone for children under the age of 10. All ages are welcome to participate: adults over 40 are encouraged to wear wrist guards. Space is limited. Skating is one of the few activities that participants can enjoy throughout their lifetime. Burning an average of 500 calories per hour, roller skating provides a cardiovascular workout, while strengthening muscles and improving balance. It’s fitness disguised as fun. Firehouse Skate ‘N Play is a locally owned indoor family entertainment center that features roller skating as the main event. Located in Vinton, Virginia. The rink specializes in roller skating, birthday parties, and family fun for skaters of all types. Since the early 1900’s, roller skating has been an enjoyable form of family entertainment and exercise. As a cardio workout that doesn’t put stress on your joints, it’s attractive to those who practice physical fitness. Aside from accidents that happen at high speeds, skating is fairly safe and provides several health benefits. Firehouse Skate ‘N Play can help you achieve and perhaps even increase your fitness goals. 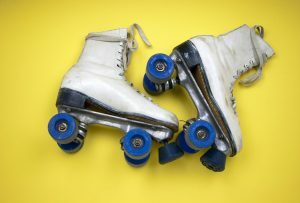 Roller skating is an attractive alternative to running — it doesn’t place stress on your joints. Which activity is more fun — burning 200 calories skating for half an hour or running for 10 minutes? 4 Things You Need To Know About Firehouse! At Firehouse Skate N Play, we like to say we are rated ‘G’ for Great family fun! It’s true: fun and family are at the heart of everything we do. We ensure you that you we will have a great time when you are at our facility. No matter if it is skating or gaming, it is tried and true fun for all! With our many attractions like skating and play zone, we believe that the best quality time is active quality time. So put away the electronics, get active and enjoy quality time with your loved ones. By providing you with the highest quality of fun offerings, we know that there is something for everyone. So no matter whether you are a toddler or a grandparent, we have something exciting for you! We love our customers! We could provide every family fun attraction in the world, but it wouldn’t mean a thing if we didn’t have great customers and families like yourself! You make Firehouse Skate N Play the best place on Earth and we thank you for that. Thank you for making Firehouse Skate N Play your destination for family fun! Firehouse Skate N Play is proud to be family owned and operated. The Horne Family strives to provide the Vinton and Surrounding areas for a fun and safe place to have fun. The next time you are looking for something to do, think local! Thank you for supporting our family business!